On June 29, in order to carry out the gist of speech by General Secretary Xi Jinping delivered at the Workshop of Further Promoting Development of Yangtze River Economic Belt and fulfill the new concepts of “innovation, coordination, green development, opening-up and sharing”, the “signing ceremony ”of six cities of three provinces in the middle reaches of Yangtze River for regional coordination in food and drug inspection and the first Xiangcheng Forum was held in the city of Xianning. Liu Fuxing, Vice Mayor of Xianning People’s Government attended and addressed the meeting. 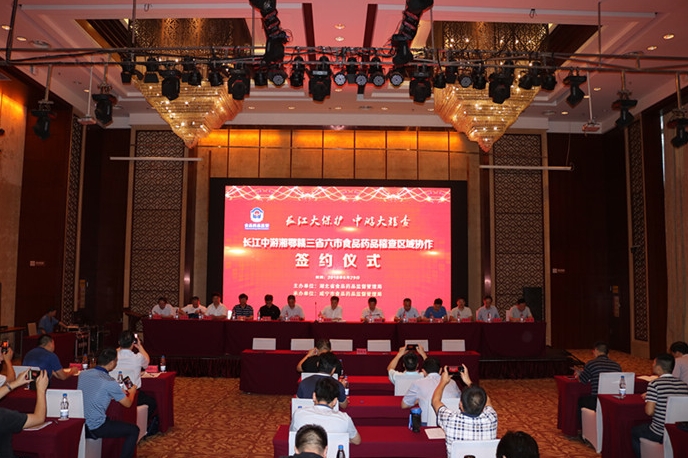 Zhu Yujie, Member of Party Group and Chief Engineer of Hubei Food and Drug Administration attended the meeting and delivered important remarks. Liao Sen, Deputy Secretary General of Xianning People’s Government presided over the meeting. The officials of the Office of Hubei Leading Group on Fight against IPR Infringement and Counterfeiting attended and guided over the meeting. Themed on “Major Protection of Yangtze River, Major Inspection of Middle Reaches”, the forum aimed to strengthen the regional cooperation in the inspection of food and drug at the middle reaches of Yangtze River, create the work layout of unified regional inspection, tighten the interconnection between different regions in inspection and law enforcement, better protect the food and drug safety within the Belt and make due contribution to the development of Yangtze River Economic Belt.